An Iridium flare so bright it is reflected in a pond. Credit: Thierry Legault. There are so many fun sights to see in the sky that are pure astronomical magic. And then there are the spectacular human-created sights. One of those sights is watching satellites from the Iridium constellation that—because of their odd shape—produce spectacular flares that can be brighter than the planet Venus. "Usually they are photographed in long exposures," Legault told Universe Today via email. 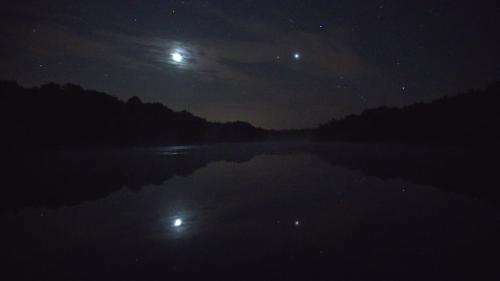 "But last summer I filmed three of them in the Big Dipper and Orion, and they were so bright a pond reflected the flare. In video you can see the real speed of the event." The third sequence on the video might look a little odd, but Legault said he rotated the camera 90°. "I found it funny like that," he said. "Tilt your head or your screen!?" According to a July Sky & Telescope article, the constellation includes 66 satellites—down from the planned 77—and is named after element 77 in the periodic table. Normally these machines drift along like a faint star, but when the sunlight catches the side just right, out comes the flash. "A really bright one can take your breath away," wrote Bob King, who is also a writer here on Universe Today. "I've been lucky enough to witness a few –8 passes and can only describe the experience as alarming. It's not natural to see a starlike object glow so brilliantly. If you've ever wondered what a nearby supernova might look like, treat yourself to one of these." But if a supernova were to move accross the sky at that speed we 'd be in big trouble.